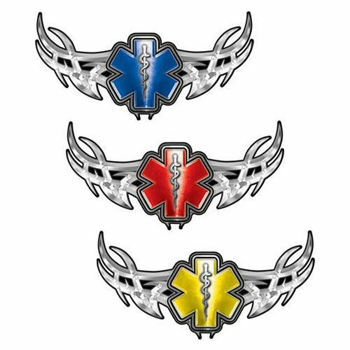 Tribal Wing Decals With EMS EMT MFR Star of Life. Unique design that will work just about anywhere. Sold as a single decal / Sticker Kit. Our new 7 Color translucent ink process makes all of the color of this graphic reflect with the reflective option and we now offer this graphic in a special canvas like interior wall decal.